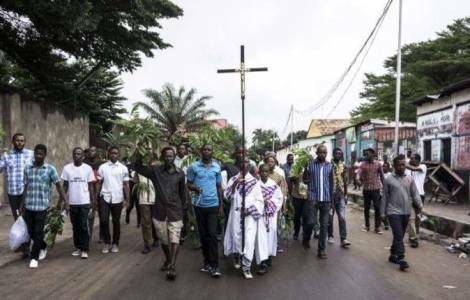 AFRICA/DR CONGO - The Bishops' alarm: "There is still much to do before the vote on December 23rd"
Kinshasa (Agenzia Fides) - "Progress has been made but there are still strong fears that the December 23 elections could be falsified". This is the message that Secretary General of the Congolese Episcopal Conference (CENCO), Don Donatien Nshole, sent to a conference regarding the situation in the Democratic Republic of Congo. The conference was organized alongside the 39th session of the UN Human Rights Council held in Geneva from 10 to 28 September. Don Nshole admits that some key points of the 2016 New Year's Eve Agreements were honored: respect for the electoral calendar, registration of candidates, publication of electoral lists. But much remains to be done to make the 23rd December vote truly credible. Among the issues to be solved are the adoption of electronic election machines, which arouse fear of the opposition that can be rigged. The Secretary General of CENCO hopes that if the majority and opposition do not agree on their use, one must return to the traditional voting method. There is also strong perplexity regarding the government's decision not to resort to international aid for the complex logistic machine necessary to organize the seats throughout the immense country (which extends for 2,345,000 km²). Especially since South and North Kivu, in the east of the Country, are upset by the violence of armed groups and the spread of the Ebola virus. "The government raised funding problems to postpone the planned elections at the end of 2016. But now at the last minute we have enough money to the point of not being interested in external financing? Was it a matter of financing or political will? It is ridiculous that a rich Country like Congo cannot have the money to organize the elections within the terms imposed by the Constitution. You cannot improvise", underlined Don Nshole. The Church has formed 40,000 election observers, which are all the more important, since foreign experts have not been invited to check the correctness of the vote.